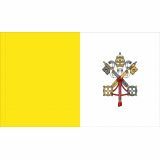 Our Roman Catholic papal flags made 100% in the USA are great options to put your religious pride on a display. We at Tuff Flags have Roman Catholic flags in various sizes including 3’x5’, 4’x6’ and 5’x8’ for all your flag flying needs during religious events and parades. Made of 200 Denier nylon fabric that is tear resistant, our outdoor flags will enhance the elegance of homes, churches and other organizations. We also have Roman Catholic indoor and parade flags with gold fringe that can be used as table top adornments and in lounges and auditoriums. Shop right away and get the advantage of the best prices, quick shipping and much more! 100% customer satisfaction guaranteed! Suitable for Parades or Indoor Display, Roman Catholic flags from Tuff Flags are great options to show your religious pride during celebrations, parades and religious events. 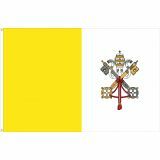 The Roman Catholic Flags feature two vertical bands of yellow on the hoist side and white on the fly side, which contains the Vatican City coat of arms, symbolised by a crossed pair of keys below the papal tiara. The crossed keys represent the keys to Heaven, while the papal tiara is a symbol of the Catholic Church's worldly influence. Our flags that are finished with heading and grommets feature UV resistant Dupont ink imprint will retain its color brilliance and beauty for a long time and are made to with precision and craftsmanship to add elegance and divinity to all your religious events. Show your faith to the Roman Catholic religion with our complete line of flags. 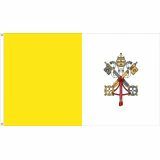 Browse our collection of Roman Catholic Flags and shop at the best rates. Should you need tips, just call us at our toll free number (888) 287-3524 or email at customercare@tuffflags.com and we shall assist you.